EpigenDx’s Stem Cell Panel covers 790 CpG sites within 33 human genes, including pluripotency-associated genes, DNA methyltransferases, imprinted genes, genes involved in X-chromosome inactivation, and cell differentiation regulators. Each assay was individually developed and validated using Pyrosequencing technology. They are tested to ensure no PCR bias, and offer quantitative CpG site specific results guaranteeing the highest quality and accuracy. 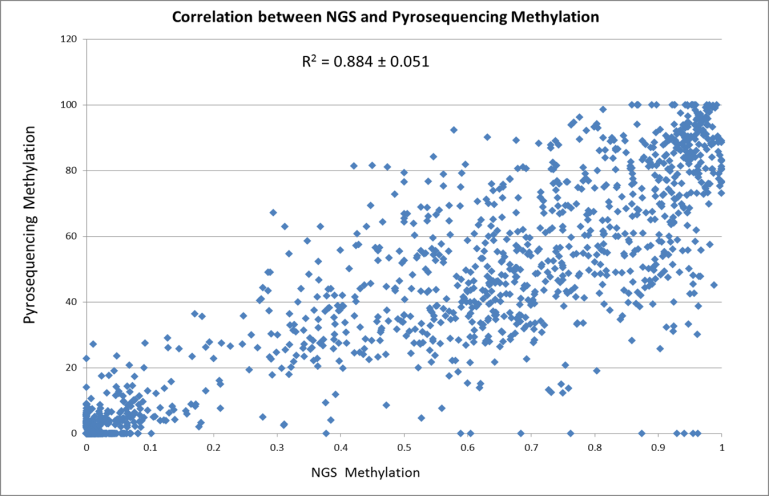 Targeted Next-Gen Bisulfite Sequencing is more economical and has a faster turnaround time than whole-genome methylation analysis (WGBS or RRBS). It allows you to analyze only the regions and genes you are interested in, and produces higher quality data due to significantly greater coverage on each CpG site. Send your samples to EpigenDx’s service laboratory. Ability to accept all types of DNA (Serum, FFPE, etc.). EpigenDx provides a complete solution: DNA extraction, bisulfite modification, library preparation, sequencing, and data analysis. Full result reports with an explanation of the data. Primers compatible with IonTorrent™ and all major NGS and Pyrosequencing technologies. Primers good for 300 reactions. Access to our knowledgeable and experienced customer service.